I heard from many different pastors and sources that Psalms is the central book of the Bible; Psalms 118 is the central chapter of the Bible; Psalms 118:8 is the central verse of the Bible. Now, I must say that I’ve heard this piece of information from a number of pastors I highly respect – even teachers of divinity themselves. However, if you ever do a proper search through the internet, or do a manual count of the Bible statistics yourself, you will wonder how these people ever came to the conclusion that Psalms 118:8 is the central version of the Bible. I’m sure there’s a fascinating story behind this piece of inaccurate information, and if you do have an idea, please, contact me and enlighten me. Somewhere along history, teachers of the Bible began to preach that Psalms 118:8 is the middle verse of the Bible. Perhaps it was a Reverend who miscalculated, perhaps it was because they didn’t have calculators or computers back then, or perhaps it simply boils down to a difference in translation/Bible version issue. It doesn’t matter. Even without the title of the central verse of the Bible, Psalms 118:8 itself is a verse to behold. Going back to the controversy… I’ve personally counted the numbers myself several times in a desperate attempt to solve the mystery behind 118:8. I checked against several different versions, I tried adding in uncounted verses to no avail. No matter how I willed myself to calculate, I couldn’t arrive at 118:8. If you are skeptical as I was and wish to calculate these numbers yourself, good luck. It is without a doubt today that Psalms 117 is the shortest Chapter in the Bible. It is also undoubted today that Psalms 119 is the longest Chapter in the Bible. Thus, it probably does make perfection ring like a bell and dazzle like a star if the middle chapter of the Bible is sandwiched between the longest and the shortest chapters of the Bible: Psalms 118. I have to admit that as a sucker for nice numbers, I was really, really, really hoping that 118 is the middle chapter of the Bible. Nonetheless, counting the chapters, with 594 chapters before and after is Psalms 117, not Psalms 118. What a bummer! Psalms 117 gets all the accolades. The shortest chapter of the Bible and the middle chapter of the Bible. There are 31, 102 verses in the Bible (in most versions I would say), and if you count the phantom verse in 3 John 1:15 (only present in some versions), then there would be an odd number and we can arrive at the middle verse of the Bible in Psalms 103:2. If you choose to count the middle verse of the Bible through the middle verse of the middle chapter, it would be between Psalms 117:1-2 (since 117 only has 2 verses). Going back to Psalms 118, while I can empathize why 118 can be mistaken as the middle chapter of the Bible (it is, after all, only one short of the actual middle chapter, and 117 is so short that many tend to overlook it); it is honestly illogical to me that the eighth verse of Psalms 118 would be considered the center. There are 29 verses in Psalms 118 – that would make the middle verse Psalms 118:15 (Shouts of joy and victory resound in the tents of the righteous: “The Lord’s right hand has done mighty things!) If you count by the total number of verses in the Bible, then Psalms 118 is way too far off the actual middle (Psalms 103:1-2) for me to be convinced. The only way I see that is possible to arrive at 118:8 is to cut the 29 verses into half (middle = 118:15), and take the middle of that middle (15) – that would be 8. This is pretty screwed up, and you can see how much I pondered over this. I probably thought too much. Of course, if you add 594 (number of chapters before the middle chapter of the Bible, the 595th) and 594 (number of chapters after the middle chapter of the Bible, the 595th), you will get 1188 chapters (there are a total of 1189 chapters, including the 595th middle chapter). Now, 1188, 1188, 118:8… kinda lame, I’m sorry, but still a beautiful occurrence, a beautiful ‘non-coincidence’ (if 118 really is the middle chapter). I wonder who thought these things up. Psalms is the only book in the Bible to pass the threshold of 100 chapters, and hence, when you say 118:8, you can only refer to Psalms 118:8. Let’s leave the numbers aside and focus on the verse itself. All these years it has been burdened with unnecessary controversy, but it actually has a lot of depth even without the title of the ‘Central Verse of the Bible’. The main point in this verse is really about God’s faithfulness – because God is faithful, and he will never leave you nor forsake you (Deu 31:6/31:8) – thus we can depend on God. Here, God’s faithfulness is contrasted against man’s fickleness (James 1:8). While we can scarcely depend on man, we can always depend on God. 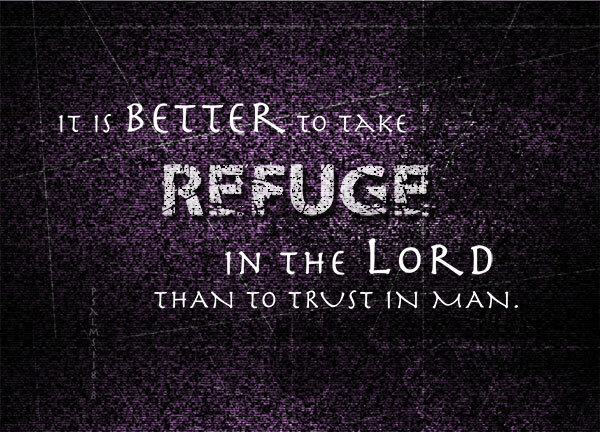 It is termed ‘better’ for us to take refuge in the Lord than to trust in man. The term ‘better’ is simple, and usually connotes higher in quality, more suitable, more advantageous, more desirable. Psalms 118:8 is intrinsically linked with Psalms 118:9 – It is better to take refuge in the Lord than to trust in princes. It’s basically the same as 118:8, a repetition of emphasis, and the highest of titles given to the term ‘man‘, yet still inferior to the faithfulness of our Lord. Perhaps the man modern people trust most today are ourselves. We have to remember that we, too, are inferior as humans. We too are fickle and lack that faithfulness that God can provide us as our refuge. We can’t be our own refuge. We can’t be our own reprieve. Why should we, when God is better? Why should we depend on the likes of man, even princes, when God is better? No matter whether you choose to buy into the tradition of the middle verse that claims Psalms 118:8 as the central verse of the Bible, or whether you think it ridiculous and inaccurate – it doesn’t matter. Psalms 118:8 is still a verse on its own, and scrapped to its barest, without all the controversy and the titles, tells us a message that we mustn’t ignore. Who is your reprieve, today? Where does your refuge lie at? Bettering yourself is not a must. It’s just another option in life. It’s just a choice. Have you considered that Psalm 118:8 is the 15,551st verse – the center verse of the Holy Bible [KJV] which has 31,102 verses.